I recently had the good fortune of attending an online tandem tasting via google hangouts with other lovely tea folk. 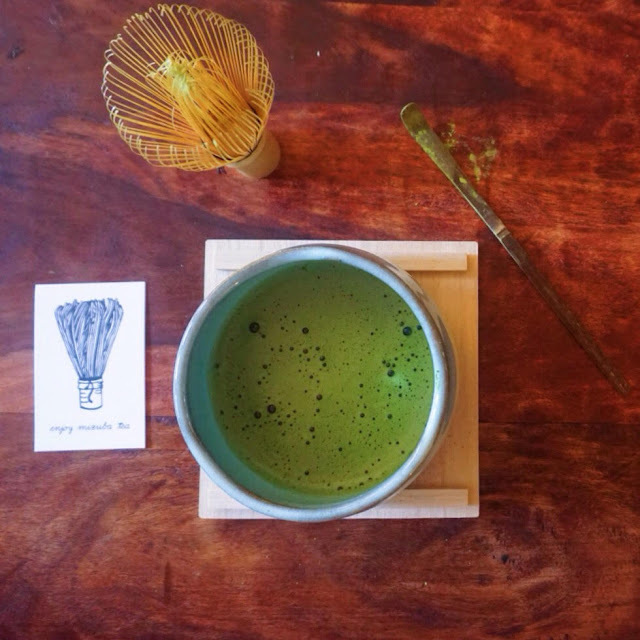 The tea discussed was Mizuba's daily matcha. The tea friends in attendance were: Geoffrey Norman, Rachana Rachel Carter, Jo Johnson, and Nicole Martin. Now let me explain first that this tasting was taking place at 9pm, and I suffer from frequent battles with insomnia where I spend way too much time contemplating every creaky, creepy sound at 3am. I was worried the matcha would aggravate the insomnia, so I decided to just enjoy everyone's company and sample it on a morning when I had time to savor it. It was torturous to hear everyone's rave review without a bowl of my own, but I've since had my turn to give it a try. Now I have to admit I enjoy matcha but I don't make it at home as much as I should. My matcha whisking skills are adequate, but require more practice. On the morning I decided to finally taste this acclaimed tea, I was focused on my matcha setup when I felt a presence sniffing about. I looked next to me and the Littlest Tea Critic had grabbed the sample bag and stuck her nose in it. I asked her what she smelled, and she said 'green tea, vegetables'. This kid knows what she's doing. The first thing that came to my mind when I put my nose to the dry powder was 'matcha cotton candy'. Seriously, if you could create matcha spun sugar, this is how I think it would smell. Sweet, fresh and creamy like white chocolate studded with spring freshly picked sweet peas. After whisking, we both gave it a taste. I have to agree with my fellow bloggers, it's an insanely smooth, velvety matcha. Visions of cream and steamed green beans came to mind. The tea only has a whisper of that sweetness from the dry powder, but it's so fresh, so green. The Littlest Tea Critic also had a few sips and her feedback came as contented sighs. This Mizbuba daily matcha is affordable and a perfect choice for anyone looking for a matcha fix.I'll definitely purchase some of this once my sample is gone. The Littlest Tea Critic wouldn't have it any other way! Thank you to Geoffrey Norman for the delicious sample and to Rachana Rachel Carter for organizing! So glad you enjoyed it and that you brought the kids into the process. Love it!